I am looking back, into the glass of the rear view mirrored lens of lovelies. These are some of the beautimous things in my remembering. I want to share with you. 1. A Lovely Film — “Quartet”. You may watch the trailer here. You’re most welcome. 2. A Lovely Poem — Today at Burnside Writer’s Collective there is a beautiful poem entitled “This Ain’t Rocket Science” by John Blase. I am fond of his poetry. All of it. This piece is lovely. If you want to read more of John’s poetry he blogs at The Beautiful Due. There are beautiful poems just waiting for you there. 4. 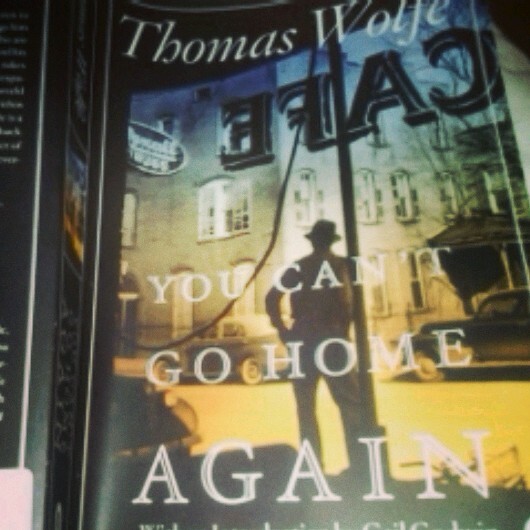 A Lovely Classic — I am slowly reading this Thomas Wolfe classic while I am “home again”. So, in fact and ironically, you can both go home again and read a tome entitled you can’t when you can when you have a propensity for shorter and much pithier writing styles. I may finish it one day, perhaps before my children have children. 6. 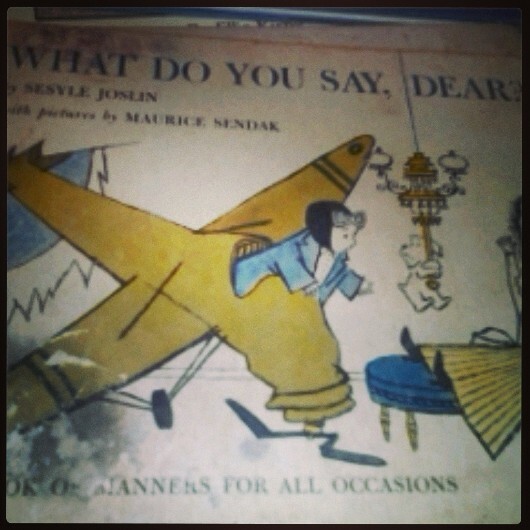 A Lovely Childhood Memory– Oh does this book bring back wonderful childhood memories. The illustrations by Maurice Sendak are whimsical and wonderful. And the humor and message for both children and adults on being well-mannered is marvelous. I highly recommend it. You are welcome, my dear. 7. A Lovely New Memory – Visiting The Chapel Of The Prodigal to see the lovely fesco with my mother while a music student practices the piano. Looking forward to this next season of Downton Abbey. Mother is too. 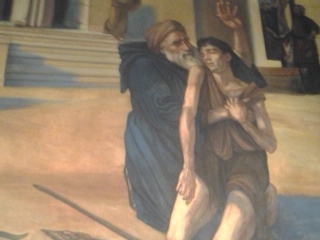 We sat and listened to the theme from this Masterpiece Theater Classic while we soaked in the glory of the fresco. 8. A Lovely Scene From The Natural World – This Oak Hydranga takes my breath away. every. single. time. I walk by. Glory be. 9. A Lovely Idea Well Executed – Emily Freeman from Chatting at the Sky blog has a monthly link up entitled “What I Learned This Month”. Visit her blog and read some rather interesting lists of things learned in July by her readers and fellow bloggers. You may especially enjoy my friend Shelly Miller’s list of July “things”. Shelly blogs at Redemtpion’s Beauty and her list can be found here. I am on instagram @graceappears and on facebook. It would be lovely to see you there. Love this, Elizabeth!! So many beauties! I never heard of that Sendak book, but I LOVE the cover art! Will have to check it out! Thanks for sharing as only you do! 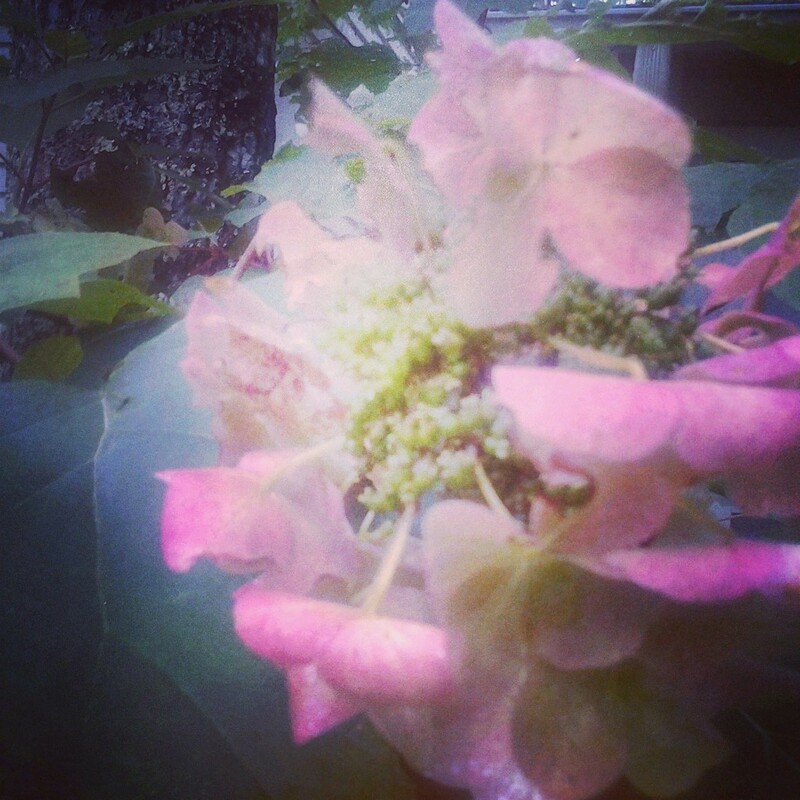 Hydrangeas make me happy. My daughter’s wedding flowers were hydrangea. In January. That’s how much we love them around here. And I just started re-watching Downton, Season 1. So many things I’m catching this time around. Swoon!